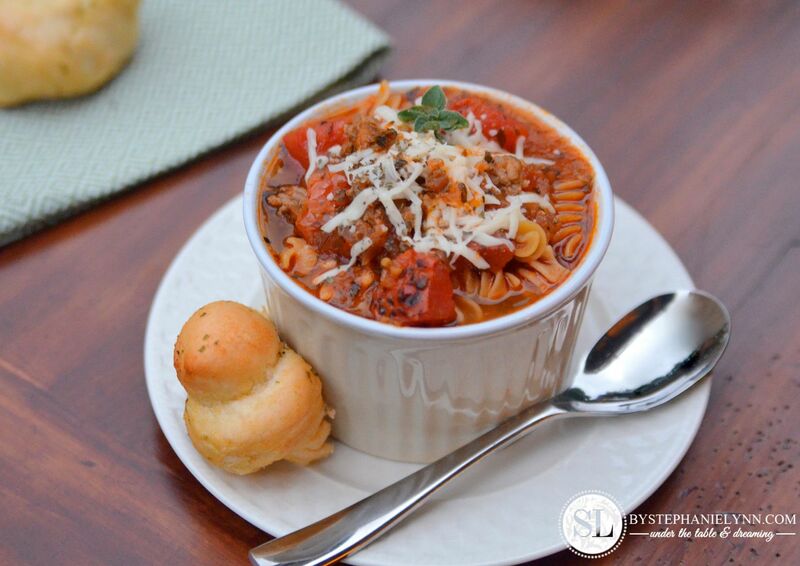 One of our favorite recipes that ranks high on the list is Lasagna Soup. Just like the family loved pasta dish, this recipe combines all of the same classic ingredients, layered together in a filling and satisfying soup bowl. You can’t see it in the picture above, but that layer of scrumptious, gooey cheese is in there – nestled at the bottom of the bowl. Pasta is one of our weaknesses. While we try to limit it on our menu there are some wholesome varieties available like Barilla’s Good For You Pasta. While shopping at our local Giant Food Store I found several alternatives that offer more nutrition than the traditional white pasta – like the Barilla Plus (with added omega and protein), Veggie (with one full serving of vegetables) and Whole Grain which I picked up for this recipe. This soup calls for a mix of extra lean ground beef and Italian sausage. If beef is preferred, the pork can certainly be omitted, and vice versa – just be sure the total amount of meat used equals two pounds. I have tried the recipe both ways and they are equally delicious. 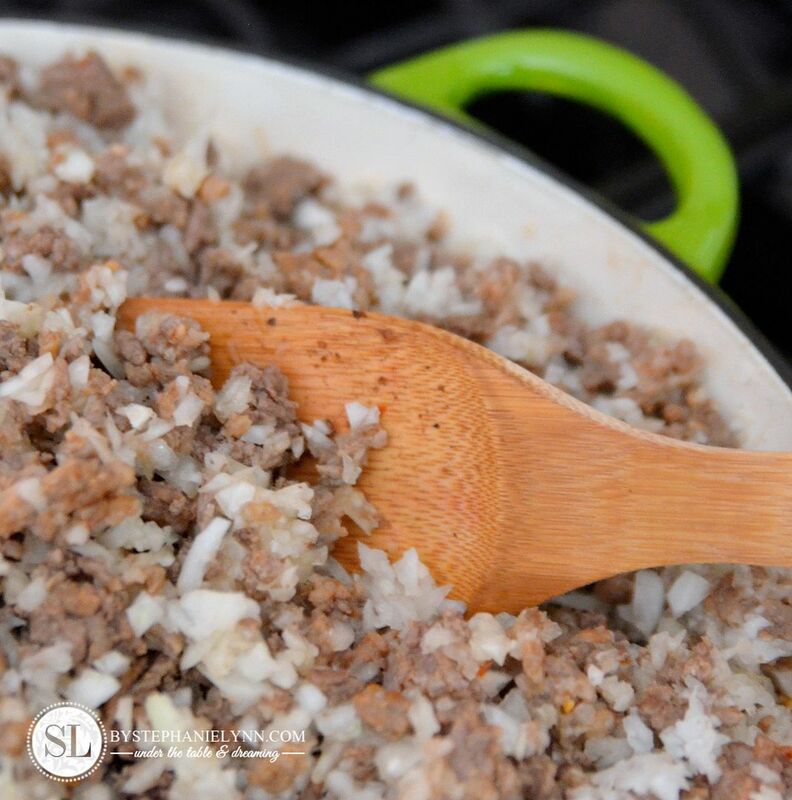 Ground turkey can also be used for an even leaner dish. When making soups I like the run the onions through a food chopper . I prefer the food chopper as it finely dices the onions and evenly chops them compared to a food processor. The onions can also be cut by hand. 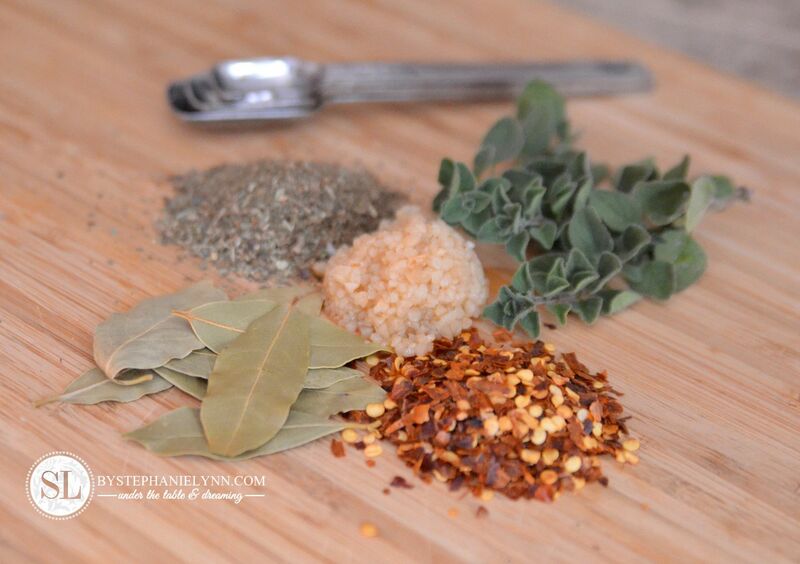 I encourage the use of fresh herbs for this recipe, if they are available – however dried herbs can be used as well. The recipe below gives the measurements for both. 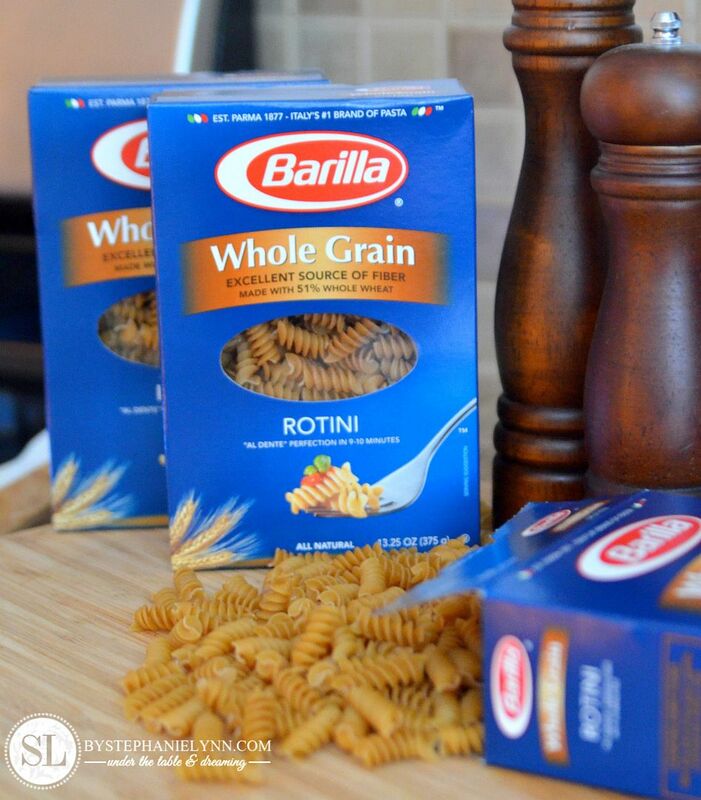 This time around we used Barilla Good for You Whole Grain Rotini Pasta. The rotini can be replaced with the shape of your choice. As mentioned above, the whole grain offers a great source of added fiber to the dish and more nutrition than traditional white pasta. Since it is a whole wheat blend we found the Barilla to be far less chewy and course compared to some other whole wheat varieties we have tried as well. if they are left sitting together. 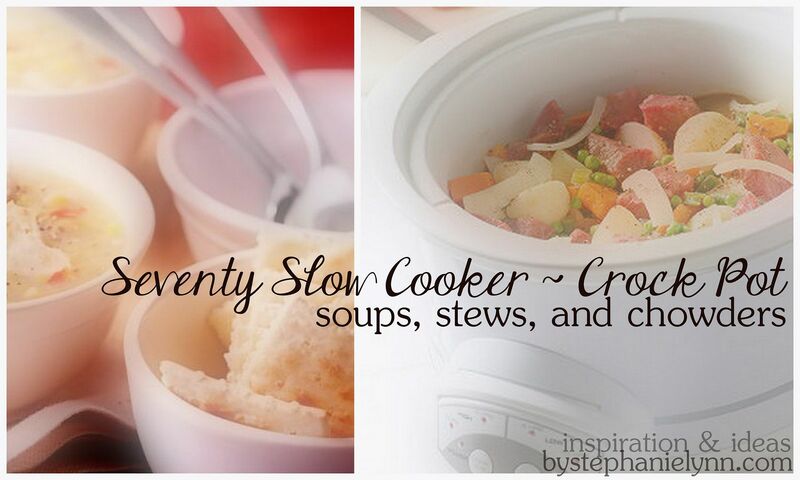 Leftovers can simply be stored in the fridge as this soup does reheat nicely (as mentioned above though – just store the three parts separately and assemble right before reheating). Heat a large skillet over medium-high heat. Add beef & sausage and cook until brown, stirring to a crumble. Drain any remaining grease. Add chopped onions and cook until the onions are soft and translucent. Stir in garlic, oregano, and red pepper flakes. Cook for an additional minute. Add in the tomato paste and stir well to incorporate. Cook until the tomato paste turns a rusty brown color, approximately 5 minutes. In a large stock pot combine the chicken broth, diced tomatoes and bay leaves. Bring to a boil then reduce the heat to a simmer. Add in the ground beef & sausage mixture, basil, salt & pepper, stirring well to incorporate. Simmer for 10 minutes. In a separate stock pot cook the pasta al dente, according to the packaged directions. While the pasta is cooking prepare the cheese base by combining the ricotta, parmesan, and mozzarella cheese in a bowl. Stir in the salt and pepper to taste and set aside. Place three scoops of cheese base into a soup bowl. 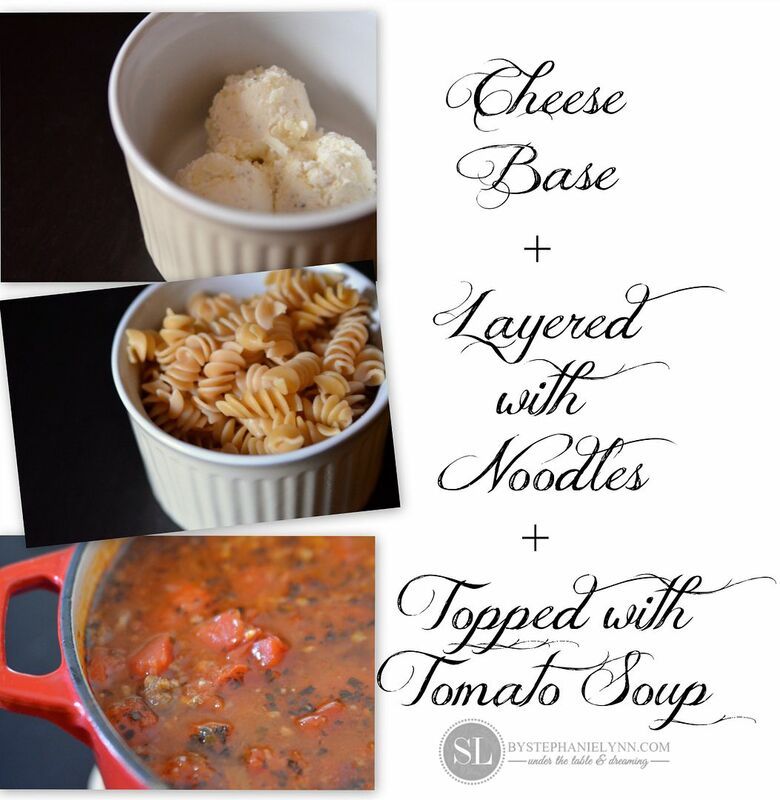 Layer with the cooked pasta and top with hot tomato soup. Garnish with shredded mozzarella cheese and basil. 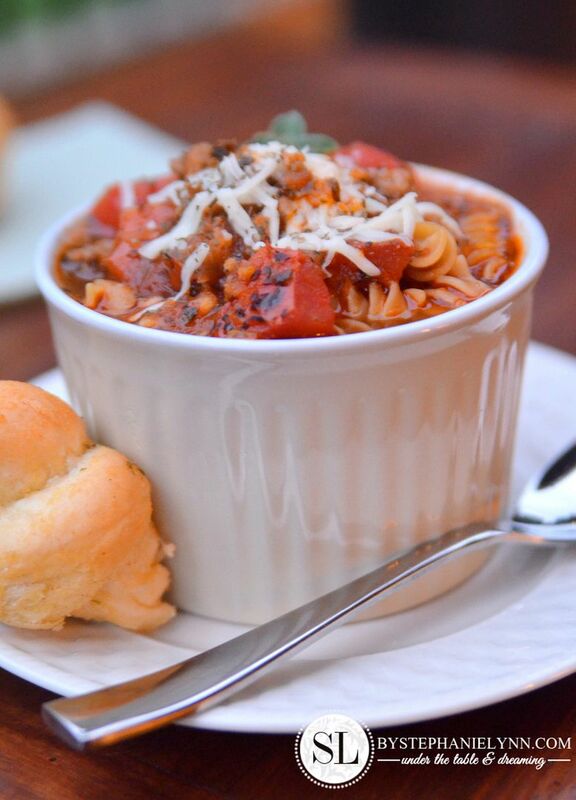 This hearty Lasagna Soup Recipe is filling enough to serve as a main dish – and when bread (and/or a salad) is added, it makes quite a satisfying dinner. It’s definitely a winner in our book and in our full menu rotation for the fall season. That looks so delicious! I think my family would really enjoy it, so I’m pinning it now! You had me at lasagna! This looks so yummy! Um yeah…lasagna AND soup!!?! What’s not to love! Thanks for the recipe! Off to Pinterest it goes!! Made this for our camp crawl at Camp. Made 3 batches and served it to 200 people (of course with a lot of other foods). 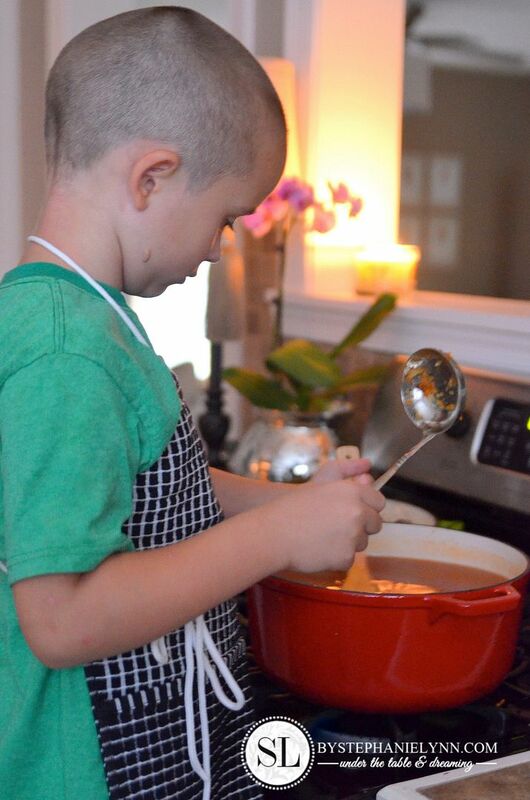 The soup was a huge hit and everyone wanted the recipe. Thanks for the great recipe.